As I was shopping the other day, I pushed my cart down the International Foods aisle on the way to get a jar of spaghetti sauce... and was suddenly jerked from my point-A-to-point-B focus by something not quite right. I stopped short in the aisle, nearly getting myself rear ended by the tailgater behind me, and pulled off to the side to figure out what my brain was buzzing on about. What had caught my eye was a bottle of Stubbs Marinade, of all things. What's so strange about that? Hmm. Stubbs... next to the Thai sauce display. Upon closer examination, I began to read the names of several local brands of barbecue sauce and other miscellaneous food items. But why weren't these things on the other side of the aisle, with the bbq sauce and other condiments? For some reason this really bothered me. Suddenly it hit me, and I began to laugh out loud. I was standing in front of the Texas section in International Foods. As distinct from the Mexican section ten feet away, here were two whole shelves of Texas foods, nestled between Thai and Indian. The humor of this realization expanded a moment later when I just had to share my discovery with the next shopper to happen along. ME: "Oh, excuse me for blocking your way. I was just so surprised to see Texas foods in the International section here, that I forgot to keep walking." (Yes, I'm the dorky lady who never met a stranger, and treats every next person like a continuing part of my personal narrative: I wonder where my baby gets that trait from). HER (appearing to be a classic native Texan--well coiffed, pleasant, a little too young to be a grandmother, maybe a touch startled to be addressed): "Oh, yes, you're right, there really are too many choices these days." I don't know that she would have understood what I was saying, even if I had stopped to introduce myself and properly begin the exchange. 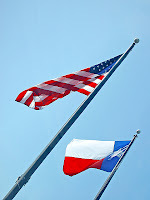 After all, what Texan would be surprised to think of her home country state as a nationality? Independence is cultivated from the cradle here, from the moment the proud parent explains that Texas is the only state in the Union privileged to fly the state flag at the same height as the American flag, because Texas was a nation first. Ahh, Texas, I love you. I am still learning to understand the self-centeredness pride you embrace. I may never be able to accept everything you represent, but you amuse me to no end. Better than that, you give me a great place to raise my kids, and for that I salute you.